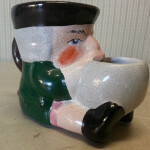 Figurals are mugs that are shaped to look like a particular figure. Often these mugs are referred to as Character mugs because they are shaped to look like different characters. These mugs are quite rare and harder to find than some Occupationals, though they don’t bring quite the same top-end prices. Authentic Figurals were imported around 1900 and usually came from Bavaria or Austria, most have a mark of a castle and crown with the text “P.M. Bavaria”. Character mugs were sold primarily in department stores pre-decorated as opposed to being a custom order from a Barber’s Supply company, this means these mugs are practically never personalized and some collectors shy away from them for this reason.